Africa’s climate is changing. Across the continent rainfall patterns are set to alter. In many areas droughts will become more frequent, more intense, and last longer. In others, new patterns of rainfall will cause flooding and soil erosion. Climate change is emerging as one of the major threats to development across the continent. At the same time, Africa’s population continues to grow. Annual growth is estimated at 2.4% and the population is predicted to double from its current 0.9 billion people by 2050. According to the Food and Agriculture Organization of the United Nations (FAO), more than a quarter of sub-Saharan Africa’s people are currently undernourished. Crop pro- duction will need to increase by 260% by 2050 to feed the continent’s projected population growth. Africa’s agriculture must undergo a significant transformation to meet the simultaneous chal- lenges of climate change, food insecurity, poverty and environmental degradation. Climate-smart agriculture includes practices and technologies that sustainably increase productivity, support farmers’ adaptation to climate change, and reduce levels of greenhouse gases. It can also help governments to achieve natio- nal food security and poverty reduction goals. Climate-smart approaches can include many diverse components from farm-level techniques to international policy and finance mechanisms. Many innovative climate-smart agriculture prac- tices take place in Africa with the capacity to increase productivity and build resilience. Yet they remain largely unknown at the continental, or even regional, levels. This book highlights just some of the array of climate-smart agriculture practices that exist across Africa’s diverse farming systems and climatic conditions. These strategies and practices can provide the impetus and the models for transforming Africa’s agriculture. 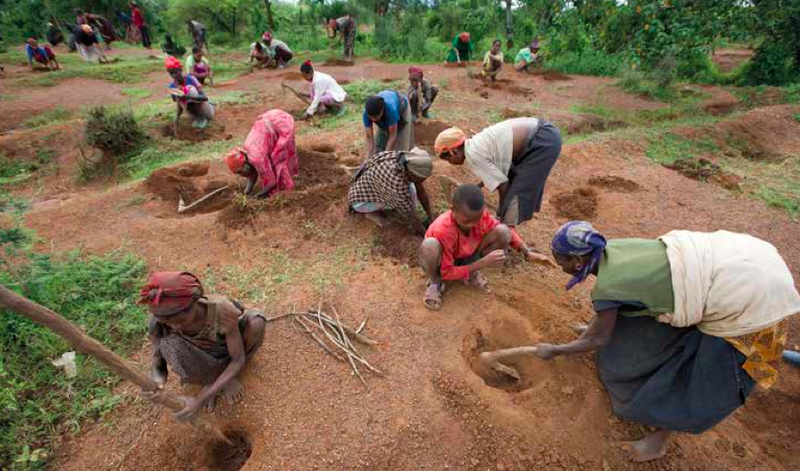 People from Ukamo village in Ethiopia take part in a tree planting project. The report identifies 8 key lessons for climate-smart agriculture, drawn from a series of case studies from across Africa. Align climate-smart agricultural practices and national policies. Food insecurity, persistent poverty, climate change and environmental degradation ae closely interlinked. National budgetary support is important. 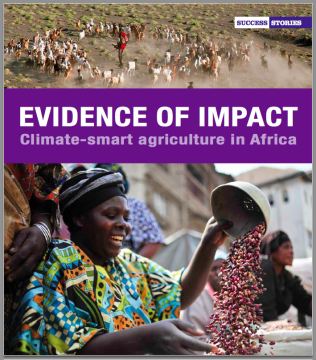 Evidence of impact: Climate-smart agriculture in Africa. CCAFS Working Paper no. 86, 2014. Copenhagen, Denmark: CGIAR Research Program on Climate Change, Agriculture and Food Security (CCAFS).